Every year I get my dad a wallet for Christmas, and every year he acts super surprised and happy when he opens his wallet sized gift. It's like our own little tradition and is special to me knowing that I get him a gift he will use each and every day. I also know that it's not something that he will take the time to go out and buy for himself, which is what I'm quickly learning with all the guys on my gift list. If it isn't food, something to do with work, or an absolute daily necessity, it's nowhere on their radar. You would think this would make it super easy to shop for them, but when they shrug their shoulders at each gift idea you throw out, they quickly turn into the hardest people on your list. 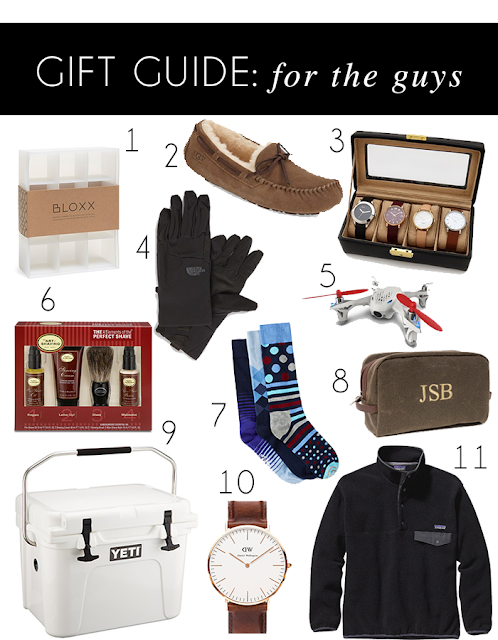 So this year, for the guys on my list, I'm focusing my gift giving on things that they'll absolutely love to get and use every day, but would never go out and buy themselves. I've also included things at each and every price point so you can mix and match some smaller items or maybe even splurge on something like the Yeti Cooler or drone! Stay tuned all week for more gift guides and sale alerts! I'll have new posts each day and be updating y'all on Instagram, snapchat (UN: kathryn_carlson), and through a page on my navigation bar titled "Gift Guide" coming soon!